Protecting Cantaloupes – You Asked It! In recent years, consumers have been victims to cantaloupe food recalls due to pathogenic contamination from the growing environment, insects, animals, or human contact. 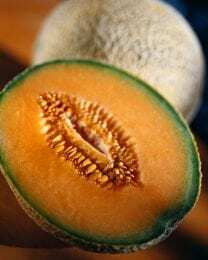 Research conducted at the University of Connecticut has shown a possible new way to prevent the growth of pathogens on cantaloupe rinds. Cantaloupe rinds are difficult to clean and disinfect. Chlorine is typically used, but is not always effective. Researchers used the probiotic, lactic acid bacteria (LAB), that acts as a natural biological control method. LAB are used in fermented foods like yogurt and cheese. They could be biosanitizers for controlling plant pathogens and soil-borne pathogens as a natural antimicrobial tool for effective decontamination. Research is on-going with the hope of promising results!